The purpose of our study is to measure the effect of theoretical and empirically-supported characteristics of sexually-compulsive individuals and those engaging in infidelity as market determinants of Ashley Madison usership. What are the practical, day to day, implications of your study? Our research demonstrates the utility of quantitatively analyzing and characterizing market determinants for a product or service as a means to produce insights that can be purposed for targeted marketing and sales efforts. The dataset used for our research is evidence that publicly-available stolen data can be used responsibility and as a means to study topics where data are difficult to obtain or problematic to collect. This study builds upon and tests the findings of many individual-level studies on infidelity and the elements of a well-known theory of online sexual compulsiveness. Per-capita income was by far the most significant market characteristic positively related to Ashley Madison usership. 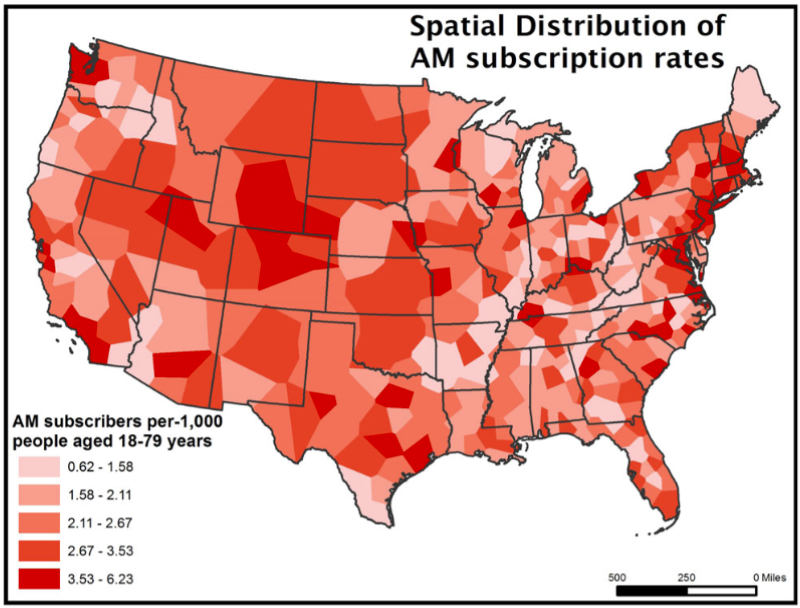 Our use of publicly-available, stolen data may inspire other geographers to view future data breaches as opportunities to research difficult-to-measure human behavior, which may have never been studies from a spatial perspective. Our research demonstrates Geography is willing to take risks (i.e., [responsibly] using publicly-available stolen data) to uncover knowledge and potential actionable insights about topics that would be otherwise difficult to study.